Called the Gentlemen’s Terrier, the Toy Manchester Terrier is sleek, lively and alert and has the look of a mini Doberman. 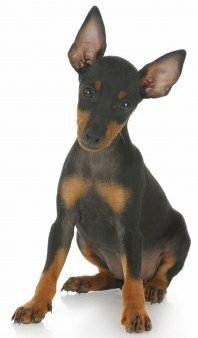 If you want the look of a Doberman, but not the size, then the Manchester Terrier may be right for you. He’s energetic, intelligent and playful making him a good choice for an active family. Terrier breeds have plenty energy and the Manchester is no exception. They love to play, chase, fetch and take walks. Even though they are full of energy, they are very adaptable and will mold themselves to whatever lifestyle their own has. After they have spent all their energy, they can sit or sleep quietly on or next to you. They are generally easy to train, but do have a stubborn, independent streak. Their personality makes them quick learners. Fun, positive, sensitive training is essential with these guys because they are not going to tolerate any abuse. Housebreaking can be a different matter entirely. They are not the easiest breed to house train so you will need consistency and patience while training. Socialization from day one is also necessary because they do tend to be slightly shy and wary of strangers. If you want a more balanced dog, begin introducing him to everyone at an early age. These dogs make excellent watchdogs. They are alert and are not shy at sounding out the warning if they see, smell or hear something. They are wary of strangers and devoted to a family making them an excellent choice for someone who needs a little extra protection. They are not likely to do any real harm to intruders due to their small size, but their bark may be enough to prevent would-be intruders from entering. Be aware, that he is terrier through and through. This means that you will need to keep him occupied and happy with plenty of exercise. He may enjoy digging and chasing, which means he’s not likely to do well off leash. A good fenced in yard is a must. Even though these two breeds look alike, have similar colors and were bred for similar purposes, both are distinctly different breeds. Manchester Terriers originated in England. 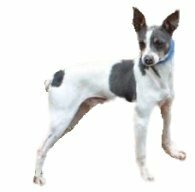 Miniature Pinschers, on the other hand, originated in Germany and share an ancestry with Dachshund, Italian Greyhounds and German Pinschers. Both breeds look like they have similar colors but when we look closely, there are differences. 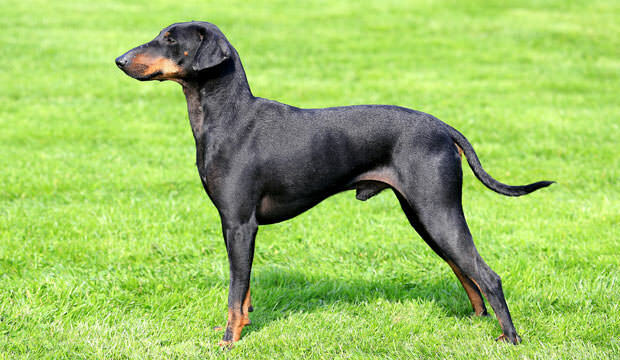 Manchester Terriers are black and tan and these colors do not run into each other. They have tan spots over their eyes and tan spots on their “cheeks. Their muzzle is tan and the tan forms a V-shape on their throat. Miniature Pinschers can look exactly like a Toy Manchester Terrier but can also come in different colors. There are differences in the personality of the two breeds. Both make excellent watch dogs, love and are entirely devoted to their owner. The big difference lies in the activity or energy level of the two. Manchester Terriers enjoy a good jog and will accompany you anywhere on a long hike. Miniature Pinschers need exercise too, but they are just as happy to curl up on your lap, making them a better choice for couch potato owners. There are two sizes of Manchester Terriers: The toy and the Standard. Both are the same with a couple of exceptions. The sole difference between the two sizes is the size of course and the ear shape. According to the American standard, the toy must have naturally occurring erect ears. This means that the ears on a puppy will eventually stand up on their own. The standard can have the naturally erect, cropped or button ears. Button ears are those where the ear tip bends forward. The larger Manchester Terrier can be between 12 to 22 pounds at maturity. The smaller or Toy weighs in at less than 12 pounds. The standard is also taller than the toy. 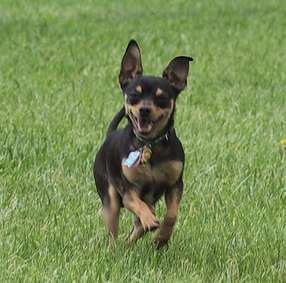 Good with other pets: Mostly, some do not like cats and small pocket pets may be at risk due to the Manchester Terrier’s “terrier” instincts. The origins of this breed date back to the 16th century and may be one of the earliest terrier breeds. The Manchester Terrier developed from the black and tan terrier and the introduction of another breed. Prior to the introduction of the new breeds, the black and tan terrier was used for hunting, and ratting, making frequent appearances in the “rat pits” of the 19th century. This “poor man’s sport was popular at the time and the black and tan terrier was one of the breeds known to be expert in the pit. There is some debate as to which breed was used in making the modern Toy Manchester Terrier. Was it the Whippet, Greyhound, or the Italian Greyhound? The new breed that emerged was still adept at catching vermon but now they could also course small game. The origins of this breed date back to the 16th century and may be one of the earliest terrier breeds. Since the small size became fashionable about the time of Queen Victoria reign, breeders worked hard to minimize their size. First, the Manchester and the Toy Manchester Terrier were two separate but interbreeding varieties. People found that the smaller sized Manchester could be a cuddly family pet, a great watch dog and still rid the home of vermin. Both sizes of the Manchester terrier remained separate breeds until 1959 when the AKC combined the two creating the Toy and the Standard. The sole difference between the two sizes is the size of course and the ear shape. According to the American standard, the toy must have naturally occurring erect ears. Cropping is not allowed. The standard size MT can have the naturally erect, cropped or button ears. The larger Manchester Terrier can be between 12 to 22 pounds at maturity. The smaller or Toy weighs in at less than 12 pounds. In England, the Kennel Club puts the Manchester into the Terrier Group and English Toy Terrier is in the Toy Group. 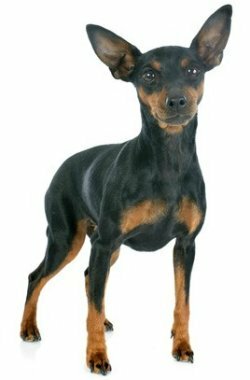 It was in 1923 that the Manchester Terrier Club of America was formed and then in 1934 the name of Toy black and tan terrier was changed to the Toy Manchester Terrier. In 1938, the American Toy Manchester Terrier Club was formed. World War II did nothing to promote the breed (or that of many breeds for that matter.) By the late 1950s, the Manchester Club of America was nonoperational, so the AKC decided to combine the two varieties. In 1958, the American Manchester Terrier Club was formed. The Canadian Kennel Club followed the American model and the Canadian Kennel Club followed the American model. This breed was ranked 130th in 2014 on AKC’s list of breeds. 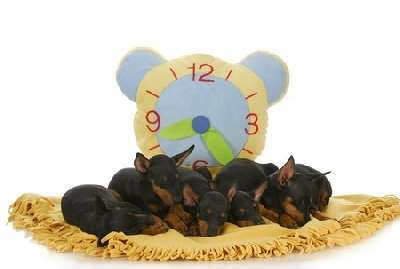 The Toy Manchester Terrier was once an excellent ratter, the reason why these dogs were developed. Now, this breed has all but retired from that role and is more of a companion than a ratter. Being a terrier, these dogs are likely to be diggers, talkers, chasers and possessive of their belongings. 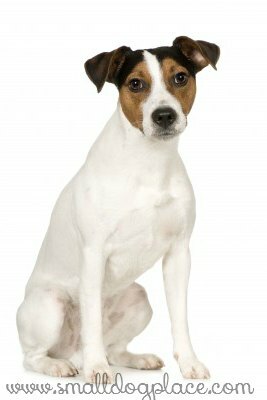 Most terrier breeds have these inborn characteristics “hunting tendencies” to one extent or another. Being a terrier type also means they are lively, curious and playful. They are neither shy nor aggressive but devoted to their family. They are very adaptable and will settle into any kind of home either City or Rural and will adapt to the active lifestyle or be content to live a sedentary life with less active humans. They are alert and often wary of strangers—two traits that make them excellent watchdogs. They are vocal and if barking is not a trait that you prefer, then this is not likely to be the breed for you. This breed is a breeze to groom. With such a short coat, bathing is a snap and air drying are all that is needed. A quick brush through with a rubber curry brush will loosen any dead hairs although these dogs do not shed much. Other than a quick rub down and the occasional bath, toenails still need to be trimmed or filed down and teeth should regularly be brushed. They generally do not have too many ear problems because of the erect placement of their ears, but a quick check during bath time is important. Toy Manchester Terriers are a relatively healthy breed. They have never achieved the popularity as some breeds, so they have not been over-bred. Conscientious breeds work hard to test for inherited disease, but like most breeds, they are prone to certain genetic diseases. 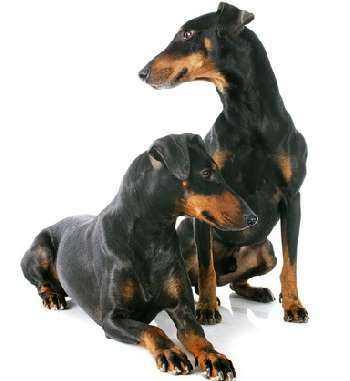 Von Willebrand's Disease (VWD) is a bleeding disorder frequent in some breeds, including Manchester Terriers. It is caused by an inherited deficiency of one of the clotting factors, similar to hemophilia in people. This can occur in both the toy and standard Manchester Terrier and results from the impaired production and secretion of the thyroid hormone. Some symptoms of hypothyroidism include skin problems, temperature changes, hair loss, and obesity. It is treated with synthetic hormone replacement. Leggs-Calves Perthes occurs when the bone that makes up the ball portion of the hip joint is damaged from a lack of blood supply. This is common in many small breeds but also occurs in both the toy and standard Man-chester Terrier. This can show up as early as four months, but usually it begins around 6-9 months of age. Pattern baldness is a slow thinning and loss of hair that begins in puppyhood, by six to nine months of age. It progresses until there are areas of complete baldness. There is no treatment to reverse hair loss and affected animals do not experience any discomfort. Hair loss is most common in the winter most dogs regrow their coat in the summer, Both the Standard and the Toy Manchester Terrier can be affected by Seasonal Alopecia. The typical onset of this problem is between two and four years of age. This term refers to an inherent disease within the muscle tissue of the heart. This particular set of problems in the heart seem to be unique to the Manchester Terriers, and affects the dog at a young age. The symptoms come on suddenly and are fatal.